Two weeks after the shootings in Paris and ten days after the memorable rallies of 11 January, emotion gives way to lucid analysis. There should be no illusion: France stands all alone. Of course, there were millions of individuals all around the globe who instantly displayed the “Je suis Charlie” slogan in order to show their compassion with the victims and their solidarity with a country whose name still stands for a certain idea of liberty. Of course, there were dozens of heads of government who gathered in Paris in order to condemn terrorism and defend freedom of expression. Yes, there was a handful of shameless hypocrites among them, but there is no reason to doubt the legitimacy of the large majority of them. Of course, religious authorities of all sorts reaffirmed their unanimous rejection of violence, which, it seems, is neither authorised nor encouraged by any religion. And even if the history of mankind reminds us of countless instances of fanatic interpretations of their respective holy scriptures, there is no reason to doubt their sincerity with regard to the horror of the Paris killings. All these solidarities are real, credible, heart-warming. Still, France stands alone. Nowhere else, “la laïcité”, this republican concept that emerged from a harsh and aggressive ideological battle fought a century ago, is understood. Certainly not in the Anglo-Saxon or Germanic world, where the French way of dealing with religion is a synonym of intolerance. Neither in other parts of Europe or the rest of the world, where the idea that you might consider religions as ideologies like any other and put them into question by ridiculing them seems to be strange at best, inacceptable at worst. 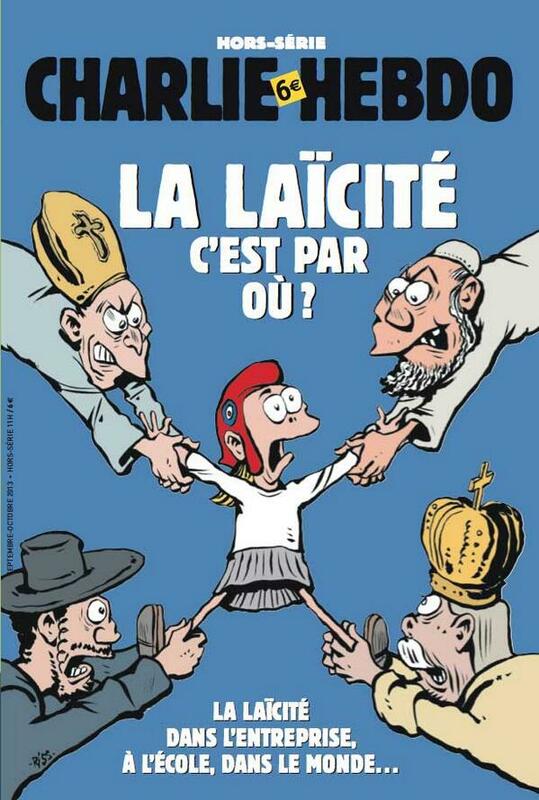 And all those in France who thought that at least the catholic church had found an arrangement with “la laïcité”, were just reminded by the pope that freedom of expression finds its limits when it touches the “sacred”. 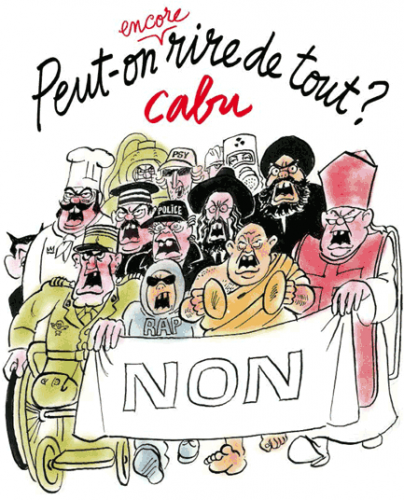 “God and Democracy”, cartoon by Julien Revenu. “La laïcité” is not a European value. The simple fact that the term is hardly translatable in most languages without losing half of its connotations, says a lot about its cultural singularity. The only other state that used to claim it explicitly, Kemalist Turkey, is currently dismantling it little by little under president Erdoğan. The author of these lines has tried to teach what “la laïcité” actually means to hundreds of students from all around the world, but to no avail. The concept’s liberating nature, its intention and capacity to facilitate coexistence of religious practices under the umbrella of secular state, the equality with which it treats all beliefs, are simply not understood. At best, “la laïcité” is considered one more French peculiarity, at worst, it is assimilated to xenophobic discrimination. “Can we still laugh at everything?” Book and cartoon (2012) by Cabu, assassinated 7 Jan. 2015. At the beginning of the 21st century, for the large majority of young citizens of a globalised world, the radical thought of Voltaire is basically obsolete, and the freedom to laugh at everything conquered in May 1968 – yet another very singular French experience – is simply inadmissible. Should the French Republic, then, stubbornly cling to its understanding of “laïcité” and continue as before? The question may be asked elsewhere, but this is not how this country functions. Of course it will. French Republican dogma has it that certain values are pillars of society that are not negotiable, and the political price anyone would have to pay for suggesting to adapt them to a different world, is too high. As a result, next time France will be attacked for its ideas, international solidarity, even from its European neighbours, is likely to be less spontaneous, less empathetic, less, well, solidary. This entry was posted in Current Affairs, Democracy & Citizenship, Global & International and tagged democracy, France, values. Bookmark the permalink.